At Offender Solutions® we are quite proud of what we have accomplished. Offender Solutions® was founded through the combined 44 years of experience of a parole officer, a juvenile probation officer, two college instructors and a justice system policy analyst. Each of these roles contributed greatly to the style, delivery and content of the work we do. As you surely know, getting results with offenders is no easy task. We don't make ridiculous claims like a 95% success rate but we do know that we use the best practices. We address the criminogenic risk factor - attitudes, values and beliefs. Offender Solutions® addresses victim issues, accountability and personal responsibility. Our approach is the most effective intervention - cognitive restructuring - and based on the ground breaking work outlined in "The Psychology of Anger" by Steven M. Houseworth, MA. We know that of the thousands of clients who have gone through - and successfully completed - this program, 89% do not re-offend with a new anger related offense within one year. We are proud of our work and expect you will be pleased with our offender solution. An 8, 10 or 12 hour online (internet) anger management class. For those without a computer, we also offer a workbook course via US mail. This anger management class is for people who have been involved in an anger related incident. This course is appropriate for mandated clients who are required to attend education classes or for those seeking help on their own. The anger management student works through several chapters and is tested after each assignment and again at the conclusion of the anger management course. A Certificate of Completion is activated at the conclusion of the course and can be printed and used as confirmation of completion. This anger management class is not intended, or adequate, for people who are repeated serious physical offenders; people who enjoy being violent or assaultive; seriously mentally ill, (i.e., psychotic), brain damaged, are unable to grasp or learn new ideas. Offender Solutions® Inc. provides anger management classes as an 8 hour anger management class, a 10 hour anger management class or a 12 hour anger management class. The anger management curriculum is based on, "The Psychology of Anger" by Steven Michael Houseworth, MA. Our anger management classes teach behavior change methods, explore anger and anger management, confront myths about anger management and totally separate the anger emotion from anger behaviors. A key component of an effective anger management class is to educate the student about the dangers of mental rehearsing anger reactions. No anger management class would be complete if it did not include anger management strategy and anger management techniques. All three anger management classes work under the assumption that the way a person thinks guides the way a person behaves. The Offender Solutions® anger management classes use a cognitive restructuring approach which basically follows the tenant of Norman Vincent Peale (1898 - 1993): "Change your thoughts and you will change your world." Our anger management classes ask the client to explore their attitudes, values and beliefs. Each of our anger management classes end asking the client to figure out what they believe, who they are and to identify their value system. To this end, our anger management classes have a victim focus and work toward understanding and developing empathy. The Offender Solutions® anger management classes began in 1994. As practitioners in the criminal justice field it was very clear that most crime is driven by one for of theft or another (shoplifting, car theft, burglary, robbery etc.) and by anger management problems (assault, menacing, domestic violence, harassment, road rage, etc.). As a result, it only made sense to focus on a specialty of theft and anger management. Our first anger management class was called Temper Talk and we quickly learned that conducting anger management classes is a formidable task. Initially we spent most of our time on techniques and, through trial and error, our anger management class evolved into the anger management class it is today. Our education, the volumes or research and practice has proven that an anger management class has little likelihood of being effective unless a key component is included - the attitudes, values and beliefs of the person with the anger management problem. Anger management clients need to change their thinking if they want to overcome their anger management issues. Strangely enough this anger management question is quite important! 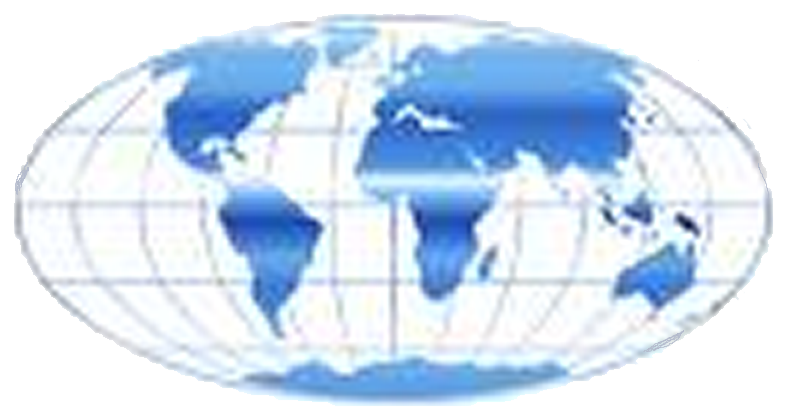 It is of high importance to Offender Solutions® that we don't try to do anything to you. Our anger management classes do not try to fix you. Our anger management classes do not judge you. Our anger management classes do not try to force anything on you and have no intent of imposing change on you. Critical to the success of an anger management class is the need to: a) be respectful of the anger management client, b) not be judgmental of the anger management client, c) not try to impose "the truth" on the anger management client and d) not try to impose change on the anger management client. Our anger management class is education oriented and works under the assumption that if you learn you will change your thoughts. If you change your thoughts you will change your behavior, your life and your world. Yes, with great confidence we are strong believers in education, we attribute education to have converted the human animal to the human being. Any change that comes as a result of taking our anger management classes is change that the client makes. We can take credit for providing meaningful information; the client needs to take credit for changing his/her anger management behavior. Life gets much better, much happier and becomes more fulfilling once anger management problems are in the past. Overcoming anger management problems becomes a self-reinforcing new behavior. Offender Solutions® offers two other forms of anger management classes. Our anger management classes are offered as an online anger management class or a anger management workbook (study at home). As previously noted our anger management classes are educational in nature and provide anger management tips, tricks, techniques and strategy - much like the in person anger management classes. One huge benefit of an online anger management class is fidelity. Online anger management classes are delivered consistently the same way for each client and eliminate natural human errors and omissions. After you have completed all of your anger management class a Completion Certificate is immediately made available to you. 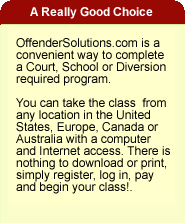 If you want Offender Solutions® to mail or email you a certificate, just ask - no added fee. Mailed anger management class Completion Certificates are embossed and can be sent directly to the person who referred you to our anger management class. Take a anger management class from Offender Solutions. Get started on a better life - now!